Franklin Graham stood up for Christians around the country when he defended Vice President Mike Pence against the openly hostile and anti-Christian New York Times after they published an op-ed article that amounts to little more than a blatant attack on Pence and people of faith. The New York Times article attacking Pence is just the latest in a disturbing direction that the newspaper is heading. Recently, the character of the paper was called into question when they hired Sarah Jeong to a position on their editorial board. Jeong has a history of tweeting out blatant racism towards white people. Despite the disturbing history of racist remarks, the New York Times admitted they knew Jeong’s history on social media and stood by their decision to hire her. 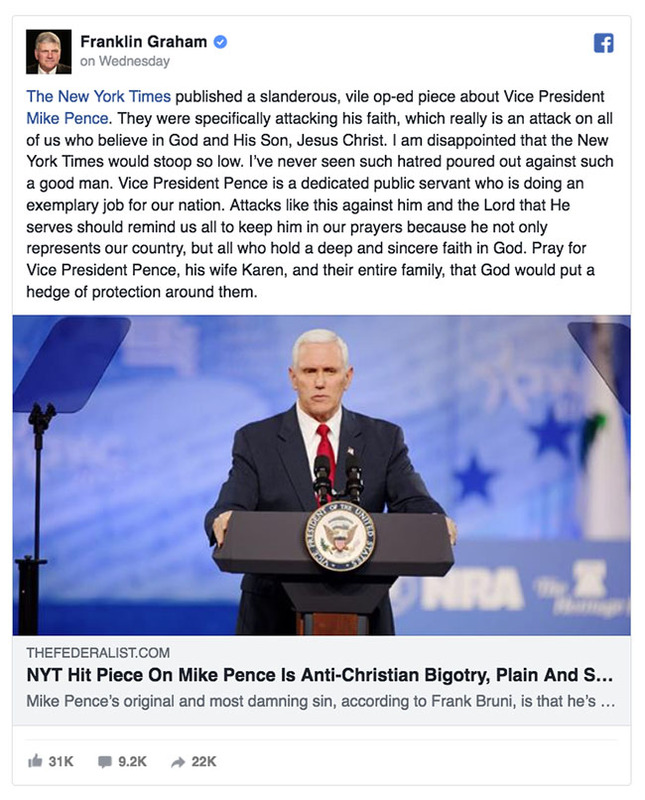 In keeping with the disturbing direction the New York Times editorial department is headed, the paper published an opinion piece in which they viciously attacked Vice President Mike Pence for his Christian faith. Opinion columnist Frank Bruni referred to the Vice President as a “Holy Terror” before launching into a disturbing and hate-filled rant. Franklin Graham issued a heartfelt response to the anti-Christian article and it is a sober reminder that faith in America is consistently under attack. Franklin points out that the article doesn’t just target Pence but in fact targets all Christians by attacking Pence’s underlying beliefs.